While the best magicians are said to never reveal their secrets, magic-themed origami is accessible to any reader who wants to amaze friends and family with both sleights of hand and cleverly folded paper. 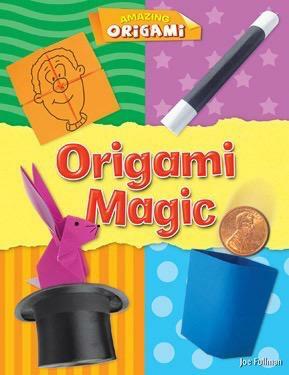 Including an introduction to simple origami folds and terms, this book includes step-by-step instructions for a magic wand, magic cup, water balloon, and more. Full-color photographs accompany each step and showcase the finished product of each project. Each craft is labeled easy, medium, or hard, making this book a great addition to the library of both new and experienced origamists.